I have been accused of being a “Sprout Pusher”. If you are not already sprouting seeds for your parrots, let me try to convince you to give it a try. 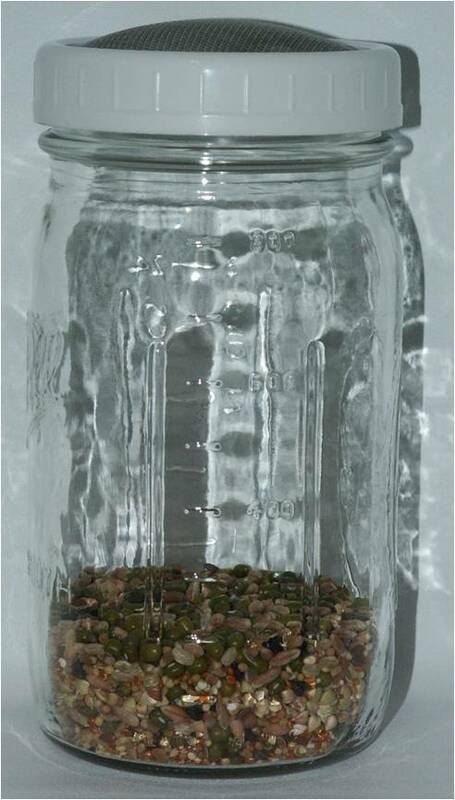 Dry seeds hold all the nutritional potential of the adult plant, but it is not until the sprouting process is begun that that potential is released. 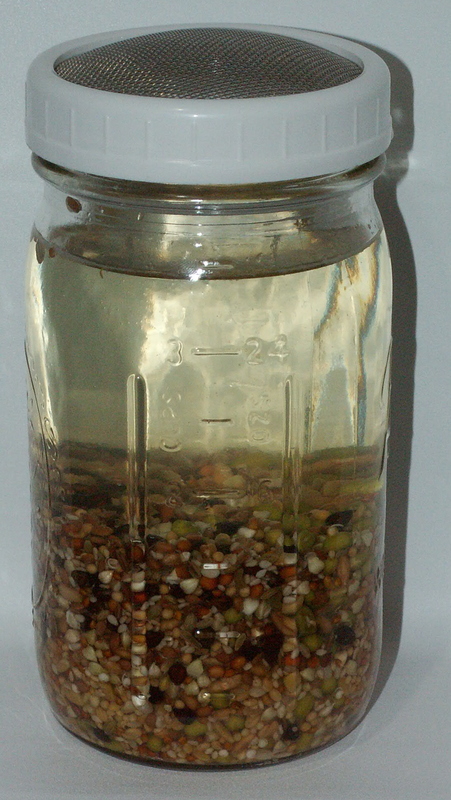 With the soaking of the seeds in water, a chemical process begins converting fats, carbohydrates and proteins into more digestible amino acids. The vitamin, mineral, antioxidant and enzyme content in sprouts is very significantly higher than in either the seed or the adult plant, making sprouts the most nutritional food available. Unlike normal produce, which from the moment it is harvested begins the decomposition process and the steady loss of nutritional content, sprouts remain alive and full of maximum nutrition until the moment your parrots chews and swallows them. Sprouting can be done in a small area right on your kitchen counter at any time of year, allowing you to always have the freshest food available no matter what the season or the size of your garden. Sprouts are the food that most closely replicates what parrots eat in the wild. If you’re still reading, I assume I’ve got you at least mildly interested, and you’re probably wondering just how exactly do you go about growing some of these sprouts? Oh, and in case you’re wondering, no, you can’t just buy them in the grocery store already sprouted, those have been sitting around a long time and are notorious for harboring dangerous bacteria. It’s easy I promise! 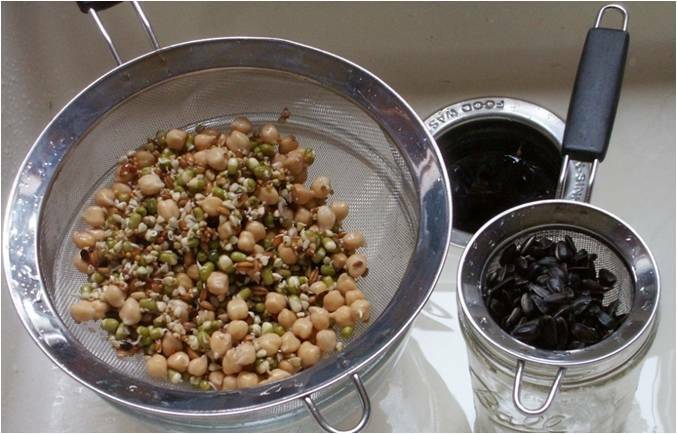 Choose your container;Sprouting cup such as EZ Sprouter, Glass Mason jar with strainer lid or mesh cover, Mesh Strainer & bowl. 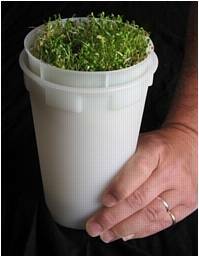 Measure out a quantity of seeds no greater that ¼ volume of the container you will be using to sprout. The sprouts will swell up in the water and begin to grow. If overcrowded, insufficient air space around sprouts will cause bacterial growth. Fill container with water and allow to soak, usually 8-12 hours. Use cool water( but if sprouting broccoli or adzuki use warm water 90-115*) Adding 5 to 6 drops of GSE (grapefruit seed extract) will kill harmful bacteria. Rinse several times in cool water, drain well. 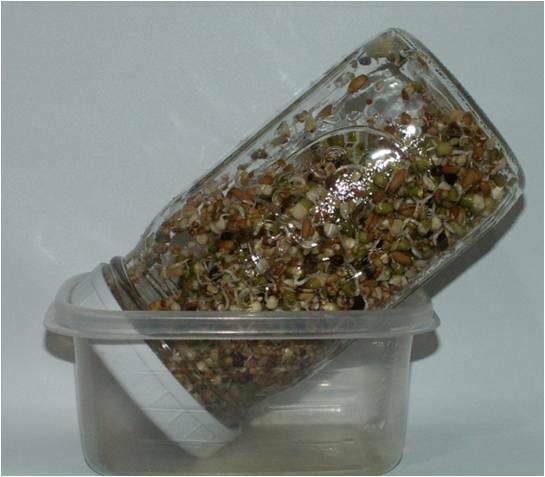 When using a Mason jar, place into a Tupperware type container at approximately a 45* angle to allow to drain completely, and then lay jar on its side for maximum air flow around sprouts. 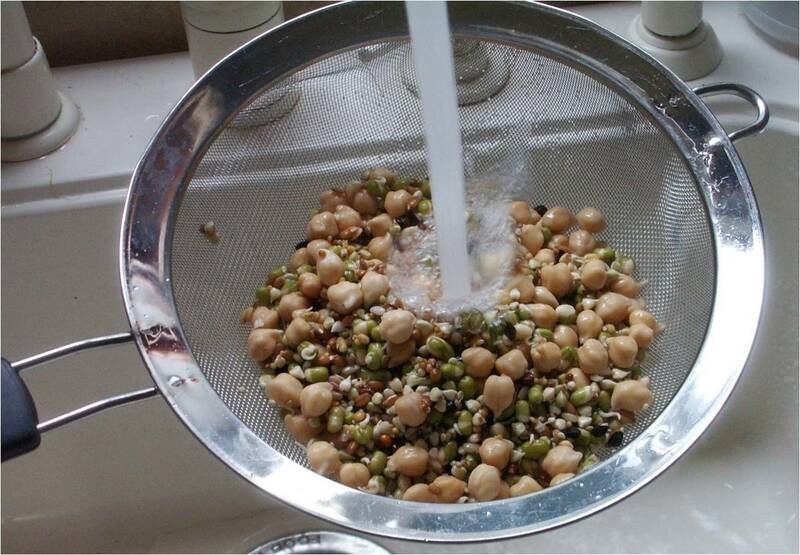 Repeat the rinse and drain at least twice a day, (3 or 4 if using mesh strainer). Keep out of direct sunlight (but darkness is not required) at average room temperature, 70*, optimally. Cooler room temperatures will result in slower sprouting, warmer temperatures, quicker sprouting. When small white “tails” appear, feed at this point, or you may continue to grow sprouts until little leaves appear. Any remaining sprouts may be refrigerated, rinsing and draining prior to feeding. If at any time your sprouts smell sour or unpleasant throw them out and start over, sprouts should always smell fresh, similar to cut grass. Amaranth: Vitamins A, B, C and E, Calcium, Iron, Magnesium, Niacin, Phosphorus, Potassium, Amino Acids. Barley, unhulled ”whole” type, (hulled and pearled will not sprout): Vitamins A, B complex, E, calcium, iron, magnesium, and phosphorus. Lowers cholesterol and builds the immune system. Millet, unhulled: Vitamin B, E, protein. Oats, unhulled (oat groats will not sprout): Vitamins A, B, C and E, Calcium, Iron, Magnesium, Niacin, Phosphorus, Potassium, Amino Acids. Good for immune system and skin disorders unless bird is sensitive to gluten. Quinoa: Vitamins B1, B2, B3, B6, folacin, copper, iron, magnesium, phosphorus, potassium, zinc and protein. Wheat: B complex, C, E, folacin, iron, magnesium, manganese, Calcium, Pantothenic Acid, Phosphorus, omega-6, Amino Acids. Flavor is sweetest when tail first appears. Legumes- Must be fully sprouted!! Alfalfa: High source of antioxidants. Alfalfa is highly esteemed in folk medicine as a cure for all inflammations including arthritis and rheumatism. It is also thought to be hypocholesterolemic and hypoglycemic. It is most popular as a blood purifier. A good source of vitamin C, E, B, beta carotene (vitamin A). Fenugreek: Good digestive aid, good for the liver, and clearing up mucus. Contains lecithin which helps to dissolve cholesterol and fatty substances. Expels toxic waste through the lymphatic system. Vitamins A, B, C, E, Calcium, Iron, Magnesium, Phosphorus, Potassium, Zinc, Carotene, Chlorophyll, Phyto-Nutrients , Amino Acids. Garbanzo: Vitamins A and C, Calcium, Iron, Magnesium, Amino Acids. 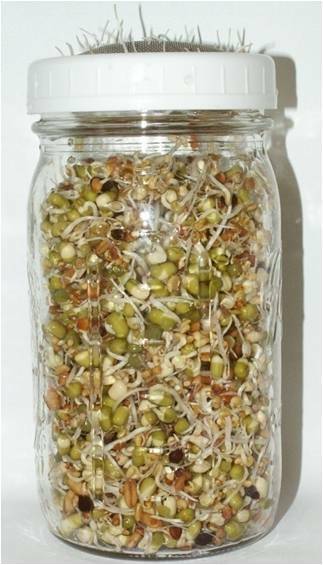 Mung bean sprouts: Vitamin A, C, phosphorus, iron. Peas: Vitamin A, iron, potassium, magnesium, beta carotene. Contain all 8 essential amino acids. Red Clover: Highest dietary source of isoflavones, anti-cancer compounds. Red clover has been used rheumatism, jaundice, inflammatory skin conditions, and bronchitis. It has been used to treat arthritis, jaundice, liver congestion, muscle cramps, and inflammatory skin conditions. Vitamins A, B, C, E and K, Calcium, Iron, Magnesium, Phosphorus, Potassium, Zinc, Carotene, Chlorophyll, Amino Acids. Almond (whole, unblanched): B complex, E, calcium, magnesium, potassium, selenium, protein and fatty acids. Soak 8-10 hours, ready to eat, may be stored in refrigerator after soaking, but use within two days, as they go rancid very quickly. Pumpkin seed: B complex, E, phosphorus, iron, zinc, protein. Soak 8 hours, ready after soaking, never really sprouts. Sunflower: Hulled or Unhulled black oil or gray stripe. Rich source of lecithin, B complex, D, E, calcium, iron, phosphorus, potassium, magnesium and unsaturated fatty acids and protein. Sprouting breaks down fatty acids into an easily digestible, water soluble form. Soak 6-8 hours, ready to eat after soaking. Dill: Digestive aid, supports the respiratory system, helps flush toxins from the body, and has a calming effect. Calcium, magnesium, iron, flavonoids, & B complex. Fennel: Aids digestion especially when uric acid is a problem as in gout. Helps normalize the appetite, used to help weight loss. Liver cleanser. Broccoli: Strong antioxidant, anti-inflammatory reduces high blood pressure, and chances of stroke, decreases inflammation of the heart & kidneys. Vitamins A, B, C, E and K, Calcium, Iron, Magnesium, Phosphorus, Potassium, Zinc, Carotene, Chlorophyll, Amino Acids, Trace Elements, Antioxidants(Soak in warm water). Radish: Vitamins A,C ,more than 29 times the vitamin C and 4 times the vitamin A of milk, calcium and protein. Cabbage: Vitamins A, B, C, E and K, Calcium, Iron, Magnesium, Phosphorus, Potassium, Zinc, Carotene. Kale: Second highest dietary source of antioxidants, Vitamin B, C, E, beta carotene, calcium, potassium, manganese, iron. 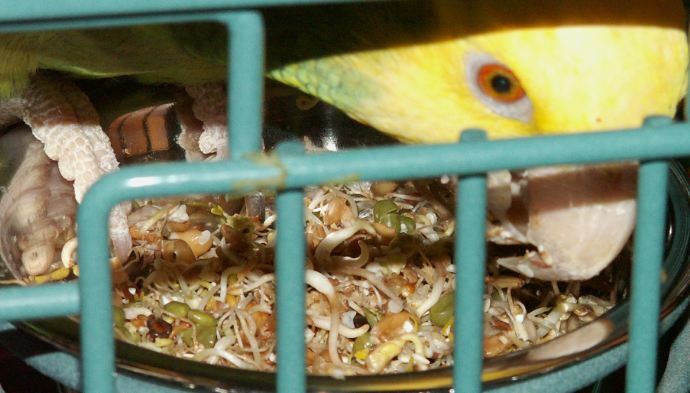 Now you have some wonderful fresh nutritious sprouts, so just how do you get your bird to eat them? For many birds it will be as simple as offering them a bowl full. Or mix them into other foods that your parrot is already used to eating, like fresh veggies & fruits, or cooked mash. 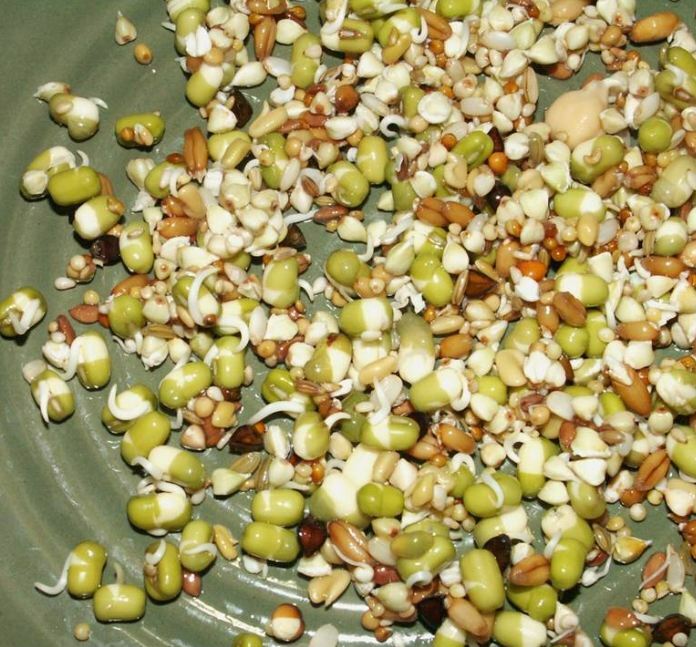 If you have a “seed junkie” that you are trying to convert to a healthier diet, mix some sprouts with just enough of your bird’s old seed mix as they will eat in one day, throw out whatever is not eaten at the end of the day. Each day, slowly decrease the amount of the old seed mix and increase the amount of sprouts and other chopped fresh veggies. Are you and your parrot hooked on sprouts now? 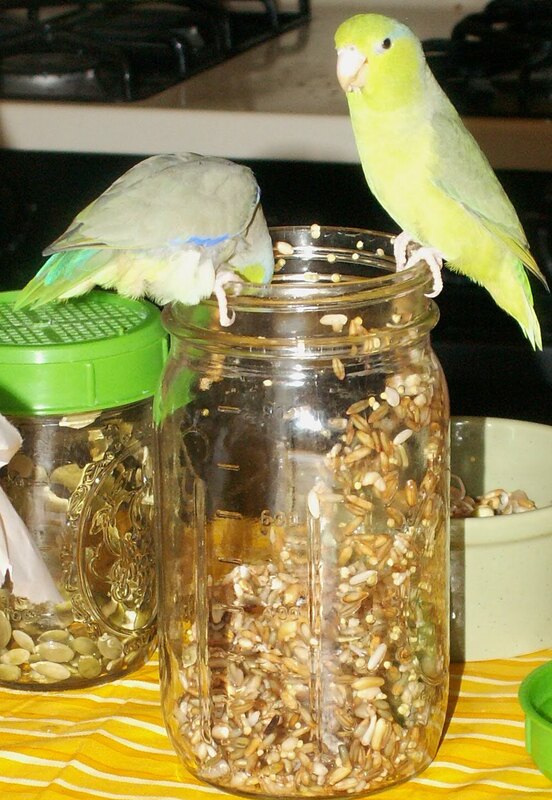 This entry was posted in Uncategorized and tagged feeding parrots, nutrition, sprouts. seeds. Bookmark the permalink. Yes we are hooked on sprouts and I’m starting to feel like a sprout pusher too, it’s so nutritious and so easy. I love being able to buy my “bird food” at the local health food store and know I am using all human grade organic ingredients to feed them. Thank you so much for the information. I was mentioning to my parrot club president that we should do a meeting on sprouts and/or chop. Eek..she asked if I’d do one on sprouts. I wanted to ask permission from you to share your info with them in a handout. I would include a link back to your blog since I myself always come back to check that I’m doing things right. Chris, yes you have my permission! and let me know if there’s anything else I can help you with. Thanks Laura!!! And I’m back today because I bought a bag of sunflower seeds in shell and they have been soaking for 9 1/2 hrs and wasn’t sure if that was long enough. I’m good to go..also soaked some almonds!! I’m hoping the fids will like them! Yup, that’s long enough, just rinse them well. make sure to keep the soaked almonds in the fridge, and use them with the couple days, they go bad really quickly. I usually only soak enough to use in a single day. Great article! I am going to try this tonight.